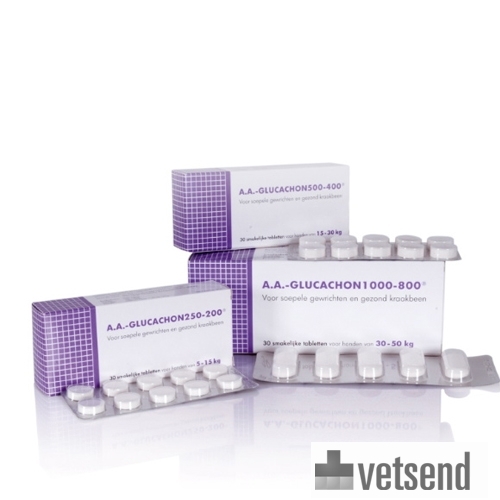 AA Glucachon is a tasty food supplement that helps maintain the elastic cartilage. Glucachon is a tasty food supplement for dogs that offers a proper dose of glucosamine and chondroitin. It has been shown that only at this high dosage does Glucachon take action, growing and maintaining the elastic maintenance of articular cartilage. Glucosamine is extracted from the shell of the green-lipped mussel and cold pressed. Chondroitin sulphate, as part of the non-collagenous hydroxyapatite calcium phosphate, is part of a healthy and elastic cartilage. Have you used AA Glucachon before? Let us know what you think about this product.